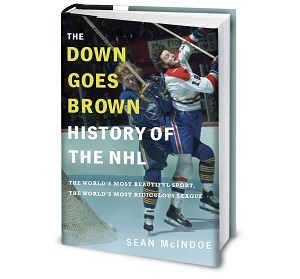 Down Goes Brown: What went wrong for the St. Louis Blues? We’re now up to four teams eliminated from the first round of the NHL playoffs. But with all due respect to the Lightning, Red Wings, and Stars, only one team sent to the sidelines so far has been a legitimate Cup contender. That would be the St. Louis Blues, who took the opening two games of their series with the Chicago Blackhawks before dropping four straight. They were officially put out of their misery Sunday, after a third-period implosion turned a tight 1-1 game into a 5-1 loss that ended what has to be one of the worst months a team has had in recent NHL history. With two weeks left in the regular season, St. Louis had entrenched itself as a Stanley Cup favorite. On April 3, the Blues edged the Buffalo Sabres 2-1 for their 52nd win of the season and moved into a tie with the Bruins for first place overall. They were seven points up on the Avs for first place in the Central and seemed set for a first-round matchup with the Wild or Stars, in which they’d be heavy favorites. And they were still riding high from acquiring goalie Ryan Miller in the trade deadline’s biggest blockbuster, a move that clearly established that the goal for this season was championship or bust. One month later, “or bust” is skating a victory lap, while “championship” sits in the quiet room trying to remember what day of the week it is. What the hell just happened to the St. Louis Blues?